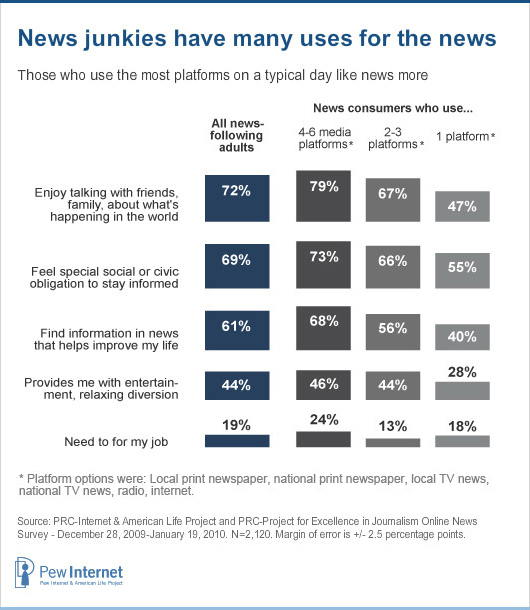 Those who read the print version of national newspapers are significantly more likely than many other platform users to say they talk to friends about the news, that they find news information that helps improve their life and that national newspapers are important for their jobs. We asked respondents to react to several statements about the performances of news organizations and the general information environment, and found several paradoxes. There is a significant amount of cultural concern expressed in media coverage, scholarly commentary, advertising and marketing professionals who lament message “clutter.” There is also concern among mental health professionals who fret that information overload is a rising problem for Americans. We asked survey respondents a question about how the volume of news might play into this: “Compared with five years ago, do you think it is easier or harder to keep up with news and information today, or is there no real difference compared to five years ago?” Some 55% say it is easier, only 18% say it is harder. One quarter (25%) feel there is no difference between now and five years ago. Women are slightly more likely than men to believe it is easier than in the past – 58% vs. 52%. Those with higher educational attainment and those who live in higher-income households are also more likely than others to express the upbeat view. And those who use a lot of different media platforms are similarly positive: 63% of those who use 4-6 different media platforms on a typical day say it is easier to get news nowadays, in contrast to just 38% of those who use just one media platform on a typical day who feel that way. Finally, tech users of all kinds are more likely than those without tech to say it is easier to keep up today: Internet users (especially those with premium high-speed plans), those with wireless connections, those with cell phones, and those who use social network sites are more likely than others to think it is easier now to follow the news. Yet even as they say it is easier to keep up with current events, Americans still feel overwhelmed. Some 70% agree with the statement: “The amount of news and information available from different sources today is overwhelming.” One quarter (25%) “completely agree” and another 45% “mostly agree.” Among those most likely to say things are overwhelming are people who use the most media platforms: 73% of those who use 4-6 platforms daily agree it is an overwhelming environment, compared with 55% of those who only use one platform who say they feel that way. When it comes to the quality of coverage itself, respondents give correspondingly mixed signals. Just under two-thirds (63%) agree with statement that “Major news organizations do a good job covering all of the important news stories and subjects that matter to me.” Yet 72% also back the idea that, “Most news sources today are biased in their coverage.” Some of the explanation for this dichotomy seems to be rooted in the views of partisans. Liberals and Democrats are more likely to say the big news organizations do a good job on subjects that matter to them, while conservatives and Republicans are the group most likely to see coverage as biased. Straight or with a point of view? Americans do not approach the news with a unified set of expectations and norms. Only half say their preference is for objective, straight news: 49% say they prefer getting news from sources that do not have a particular point of view; 31% prefer sources that share their point of view; and 11% say they prefer sources whose point of view differs with theirs. The rest say they don’t know their preference or don’t want to declare it. The people who are more likely than others to prefer sources with no point of view include: internet users who get news online, whites, and those with higher levels of educational attainment. Those without strong partisan ties (i.e. Independents) or ideological connections (i.e. moderates) are also more likely than partisans to want their news straight. Those who are disproportionately likely to seek out news sources that match their own views include Republicans and conservatives. 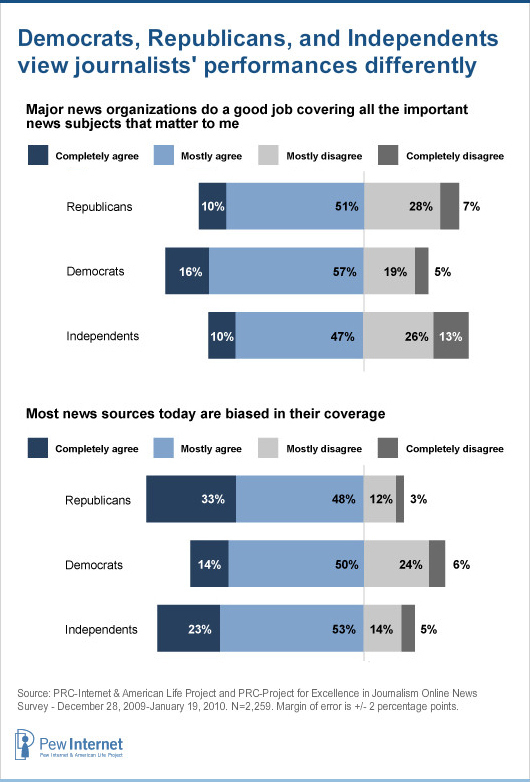 Democrats, in contrast, are more likely than other groups to seek out news that either supports their own views or differs from their own views (as opposed to seeking out news coverage that has no particular point of view). There is no notable technological element to the preference for news that matches one’s own views – heavy tech users, light tech users and non-tech users are relatively close in their preferences. Broadband and wireless news seekers are no more or less likely than others to want to find news sources that share their viewpoint. This cohort that prefers news from compatible sources is an interesting group of news consumers for several other reasons. For instance, they are significantly more likely than others to say that consuming news is entertaining and relaxing to them. They are more likely to say they would like more coverage of religious and spiritual news. And they are more likely to say most news sources are biased. When asked a series of questions about their personal posture towards the news, people express a variety of approaches. Majorities of American adults identify at least somewhat with each of the three postures we asked about: whether they like to come across news they have not thought about much before; whether they only follow news about specific topics; and whether they rely on people around them to keep them informed. 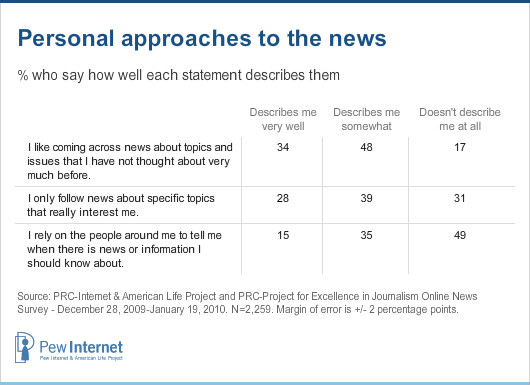 Who are the 34% of respondents who most appreciate serendipitous encounters with news items? They are disproportionately composed of those who are avid news followers, those who use several news media platforms on a typical day (especially the internet), and those with college degrees and higher levels of household income. 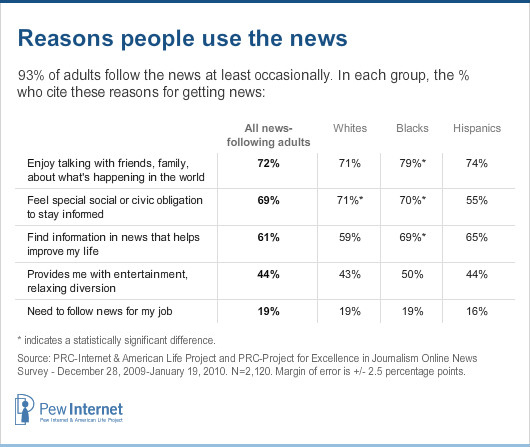 How about the 28% who most identify with only following specific news topics? This group is skewed towards those who prefer news sources that share their point of view, men, minorities, and those under age 30. Interestingly, there are no significant differences in the answers to this question that align by ideological viewpoint or party identification.